At its September 2017 event Apple unveiled the Apple TV 4K, the latest generation of its set-top TV device, which brings Apple's smart TV functionality to any old television - and now with support for 4K and HDR. It's a welcome (and probably overdue) update to the Apple TV hardware, but it highlights a major questions that's hanging over the device: should you buy an Apple TV at all, let alone a new 4K model? Apple TV is, despite the name, not a TV at all. Instead it's a small box that plugs into an HDMI port on a TV (though Apple doesn't actually include an HDMI cable in the box - you'll have to buy that separately) and lets you access a range of apps so that you can stream and download TV content. As for the '4K' side of things, the latest Apple TV allows you to do all of the above but enjoy content that's available in HDR and 4K - aka Ultra HD - so long as you have a 4K TV to take advantage of it. All of that sounds like a lot of functionality, but it comes at a price: £179, to be specific. That goes up to £199 if you want to jump from 32GB to 64GB storage, or down to £149 if you don't mind ditching the 4K support. This is pretty easy to answer. If you don't have a 4K TV anyway, then definitely don't upgrade - you won't get any benefit from the new model. Here's the main reason you might not need to buy the Apple TV: you probably have all that functionality already. That's even more true for 4K, so if you already have a 4K TV - or are planning on buying one - odds are that the TV itself does almost everything that the Apple TV offers, and will happily let you stream TV and films to your heart's content. You'll also likely find very similar functionality on a PlayStation 4 or Xbox One in case you own either of those consoles. Still, there are a few things Apple TV offers that your regular smart TV might not. For one, it includes a hard drive, which means you can download films and TV from iTunes or its equivalents to watch later - ideal if your internet connection isn't quite fast enough for streaming. There's also the gaming side. Sure, most serious gamers aren't likely to be too fussed about the Apple TV's processing power, but it does let you play a range of iOS games on the big screen, and that's something that not many of its equivalents can manage. Apple TV also offers better integration with Apple's own services (surprise surprise). That means small things like being able to cast photos and videos from your iPhone to the TV, but more importantly means iTunes support. There's no iTunes app for other smart TVs, so if you've already sunk money into TV and films on iTunes, the Apple TV is the only easy way to directly play them from your TV. Then again, even in that situation it's worth thinking about how much those shows are worth. After all, it's unlikely you've bought £180 worth of movies on iTunes, so rebuying them all on another service would probably still work out cheaper than buying an Apple TV. What if you don't have a smart TV at all though? 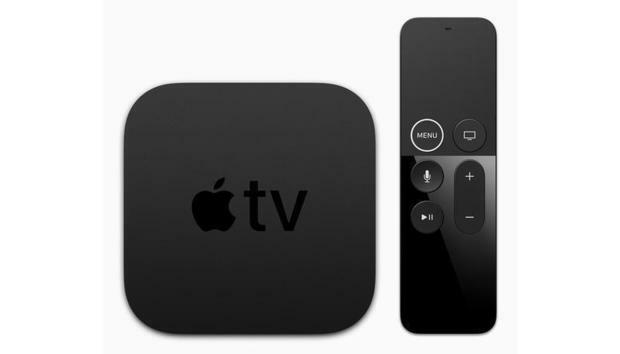 Is Apple TV your best bet, or are there cheaper - or better - alternatives? The key rivals to the Apple TV - especially in its new 4K variant - are Google's Chromecast and Amazon's Fire TV, both of which offer roughly the same functionality. Both plug directly into a TV's HDMI port, and come loaded with a selection of apps to stream content. Both also offer more expensive 4K-compatible models, and the Chromecast will let you cast content from a phone or tablet, while Fire TV will let you use Alexa to navigate. It's a similar story with Amazon. The regular Fire TV Stick is currently £39.99, and the 4K Fire TV is £79 - though that's currently listed as out of stock on Amazon's own site, amid speculation it's about to release an updated version - though you can still buy it refurbished for £74.99. It's also worth noting that there are rival boxes and streaming sticks from Roku and Now TV, but at the moment neither offers a 4K model, so they can't compete with the top-end Apple TV. « Which apps won't work in MacOS High Sierra?